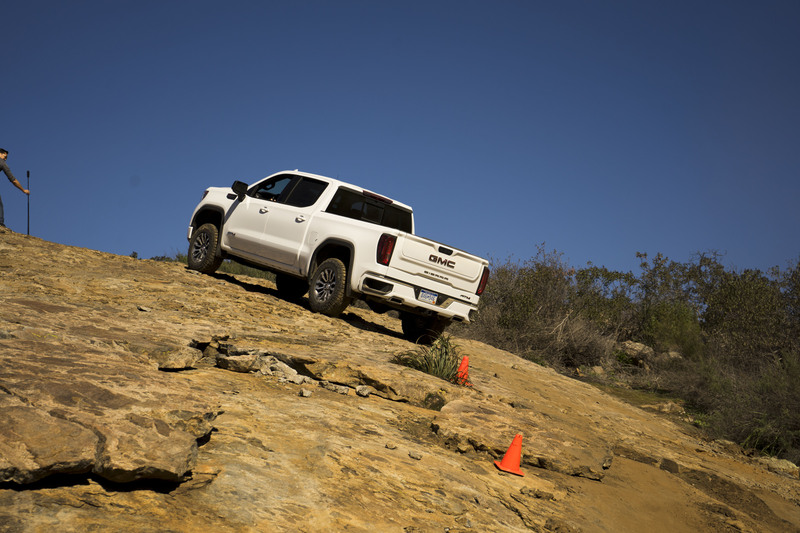 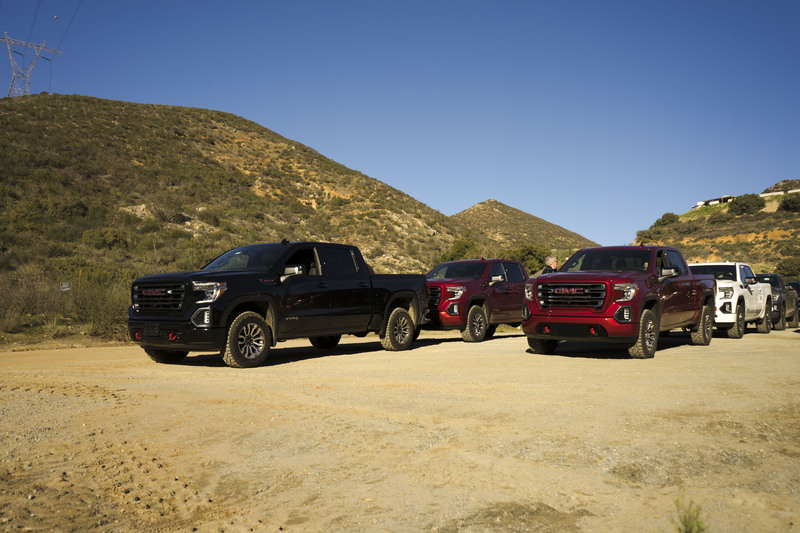 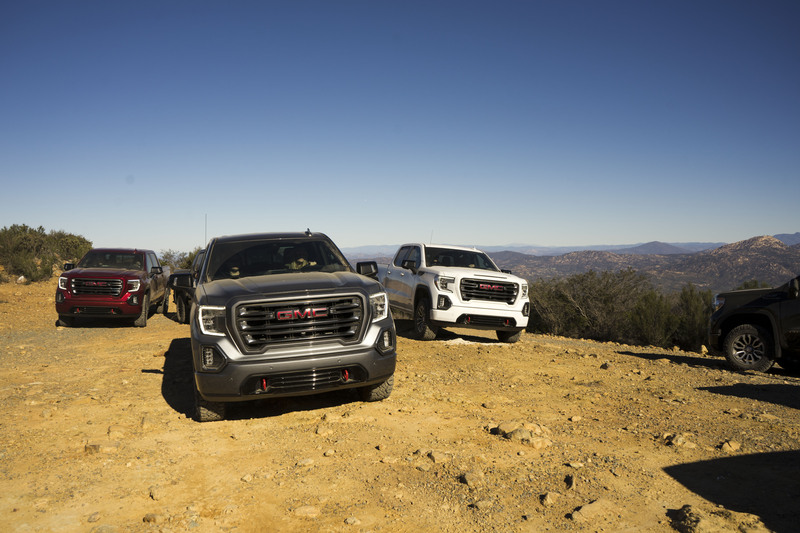 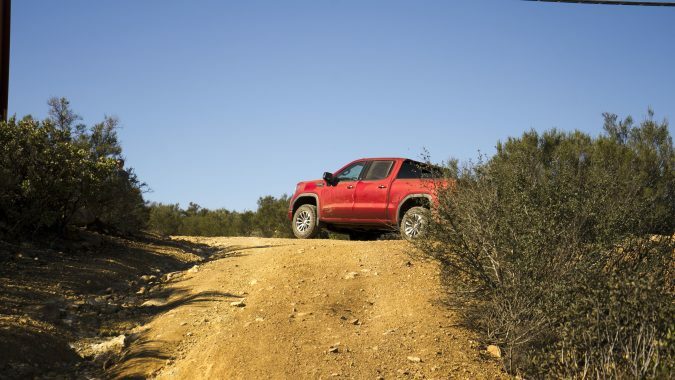 Off-road enhanced Sierra AT4 takes on the California desert. 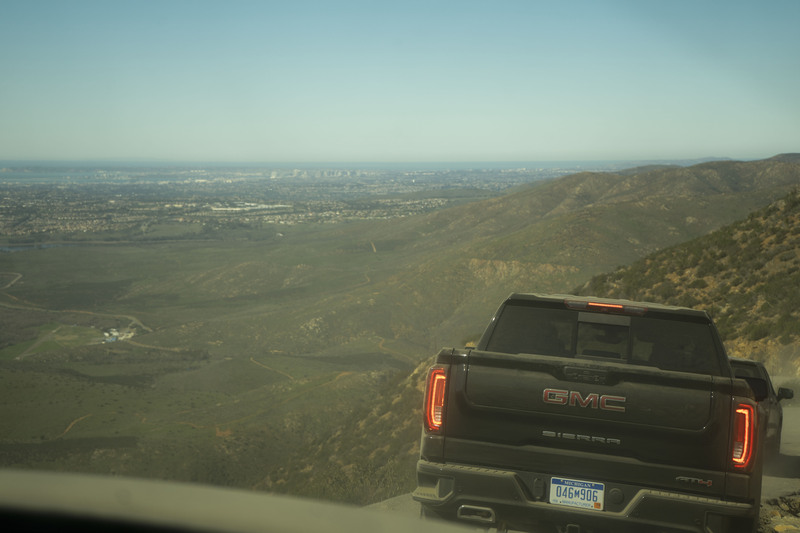 SAN DIEGO, CA – Spending time in beautiful Southern California is even sweeter when the weather you’re leaving behind is snowy and cold. 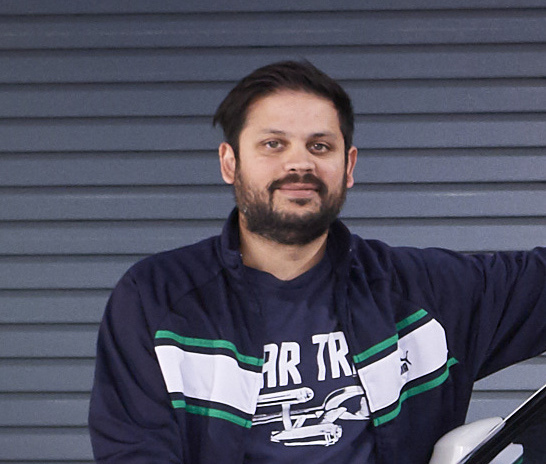 Unfortunately flying there in January can mean long delays and lost time sitting on airplanes that are waiting to get de-iced. 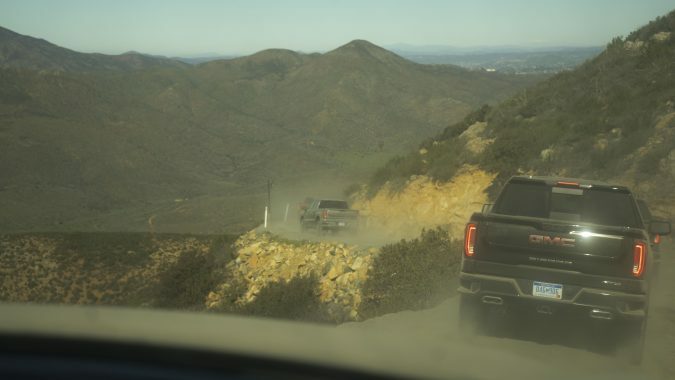 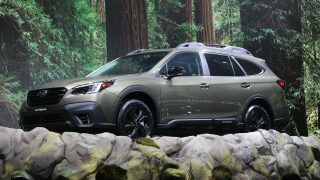 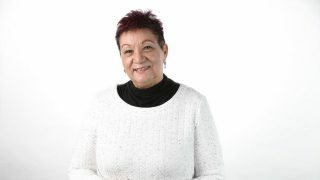 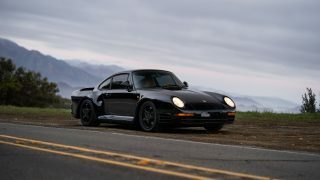 But that’s the nature of air travel in the winter and it’s a small price to pay when your trip includes an off-roading excursion through the mountain wilderness just miles from the bustling metropolitan centre of San Diego. 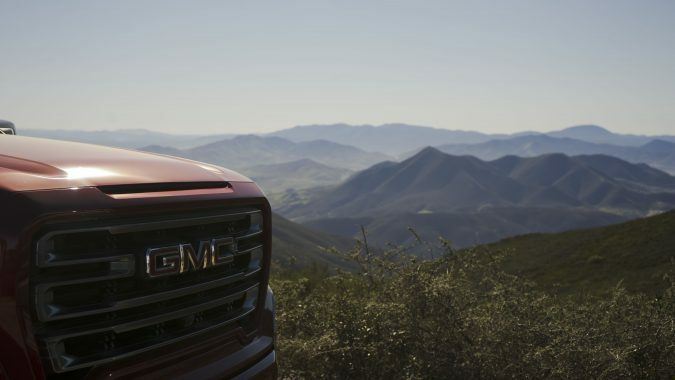 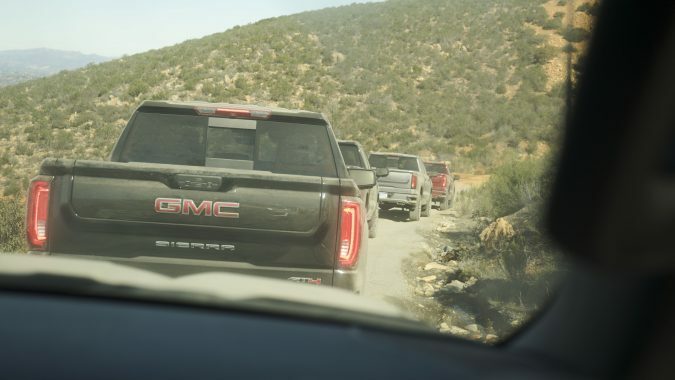 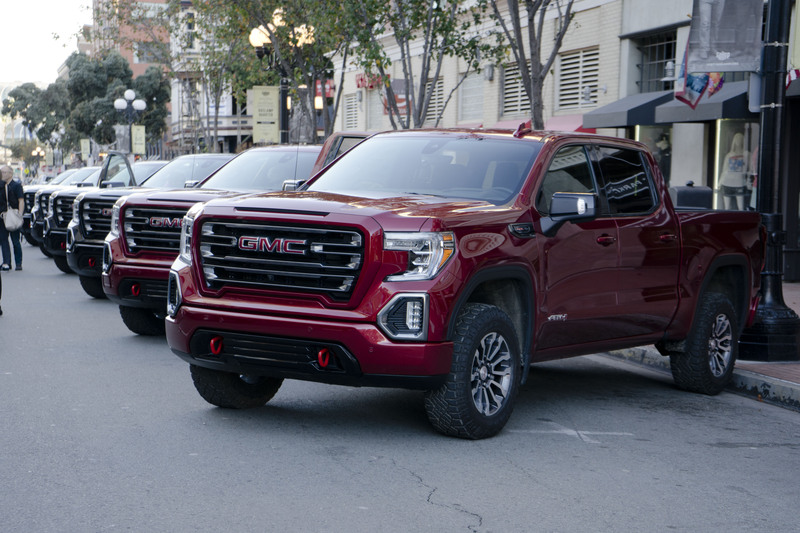 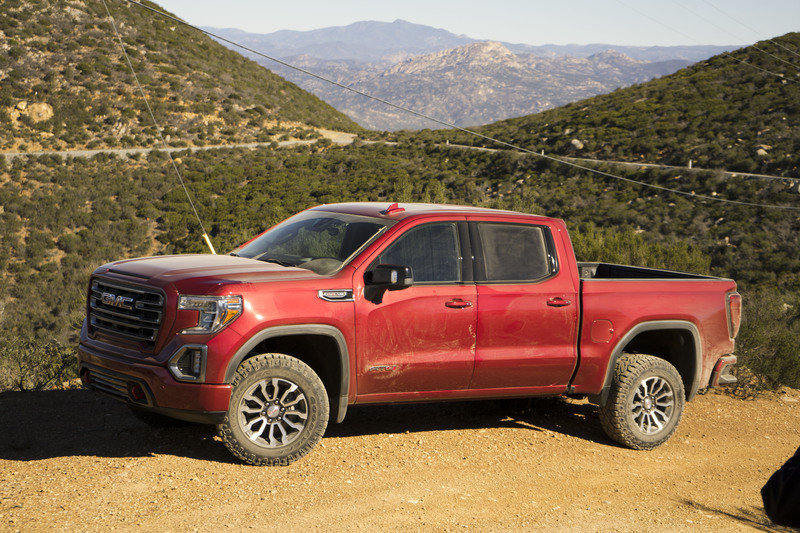 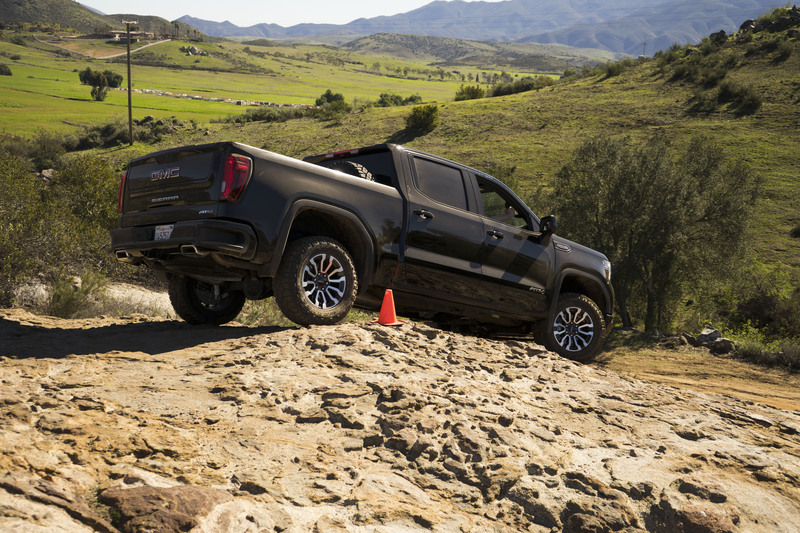 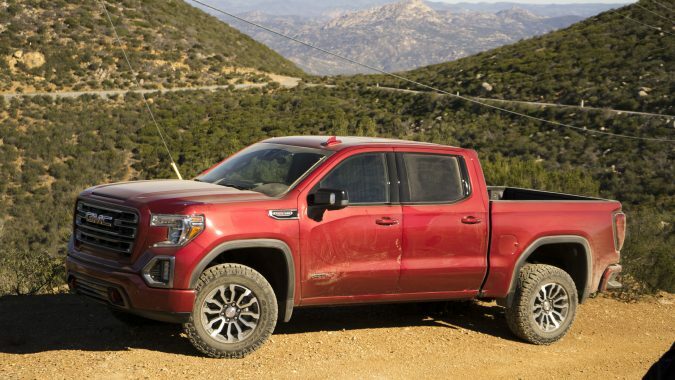 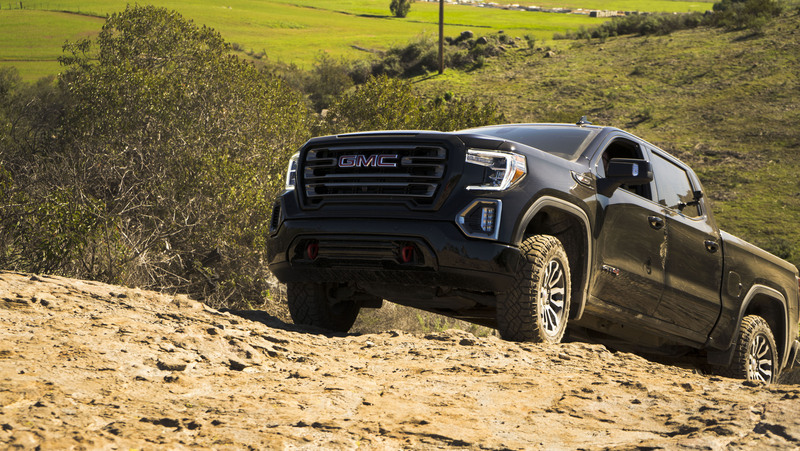 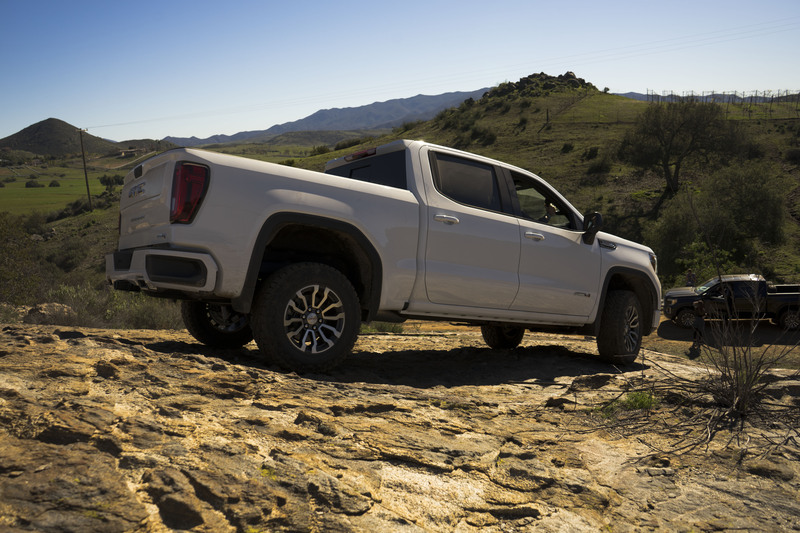 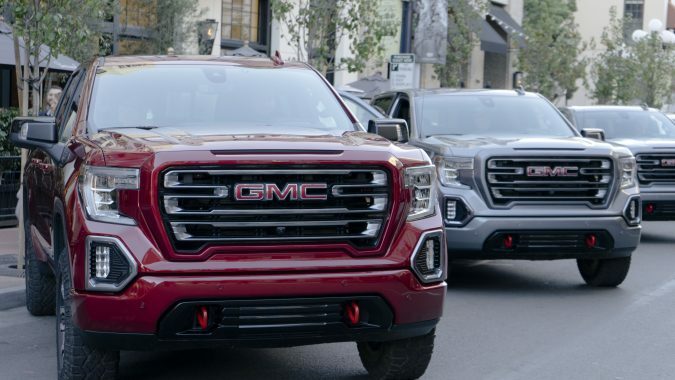 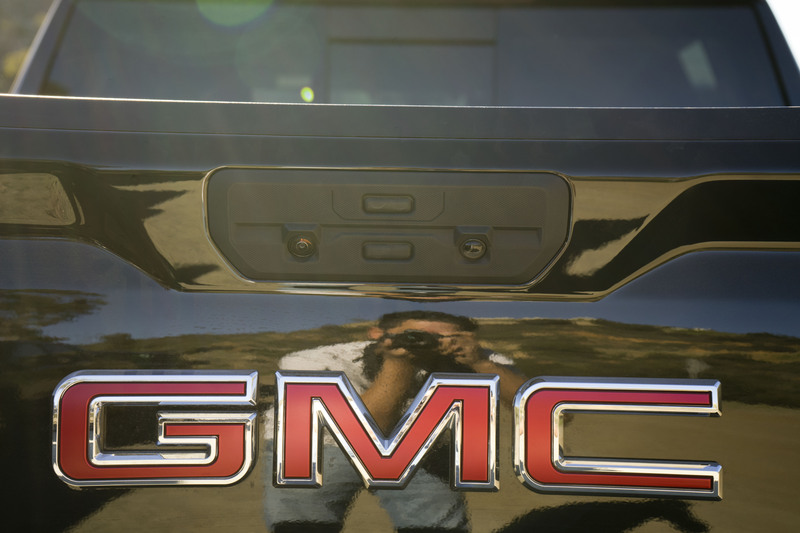 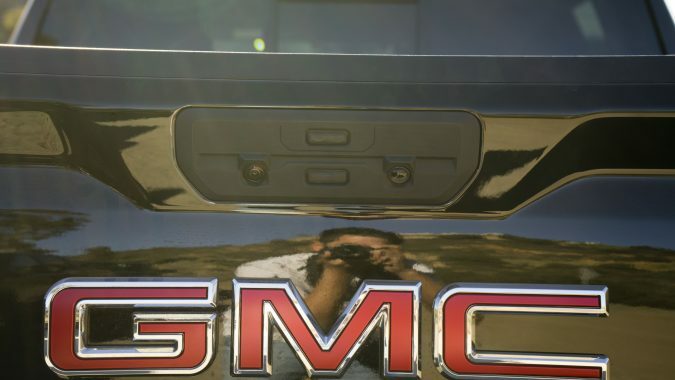 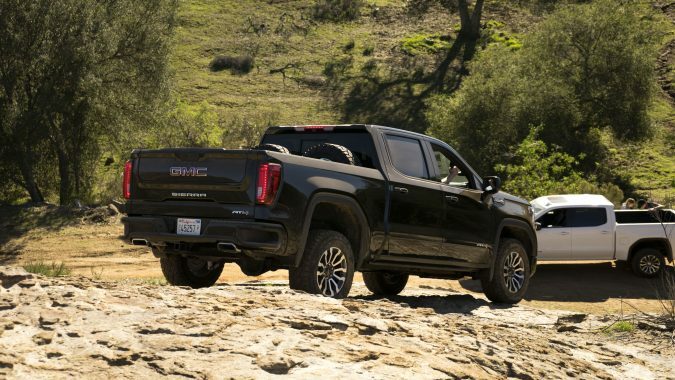 We would be driving the 2019 GMC Sierra AT4: GMCs off-road enhanced half-ton. 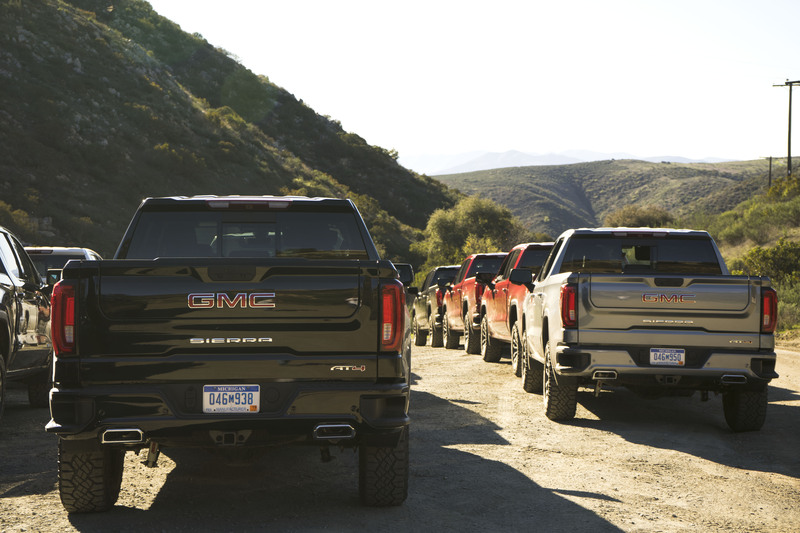 Like the Trail Boss is to the Silverado, AT4 is to the Sierra. 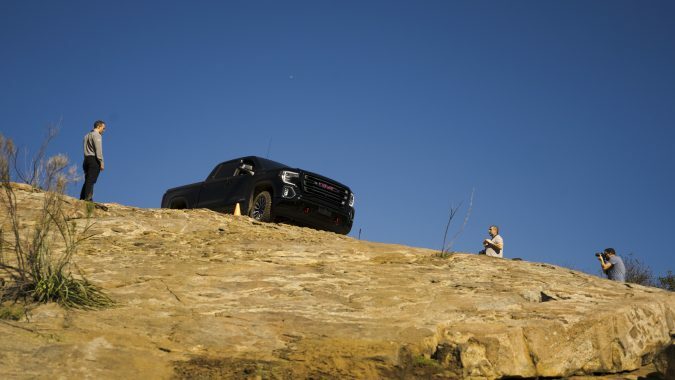 So that means a 2-inch factory lift, Rancho shocks, a 2-speed transfer case, locking rear diff, and skid plates. 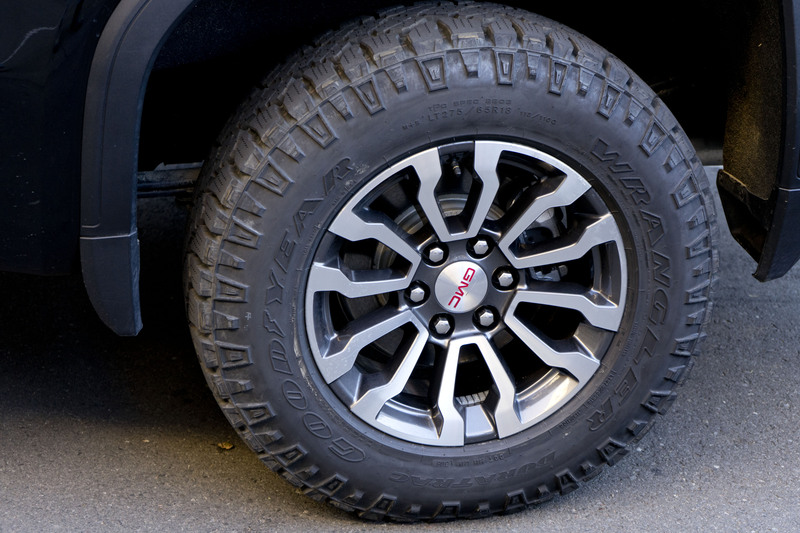 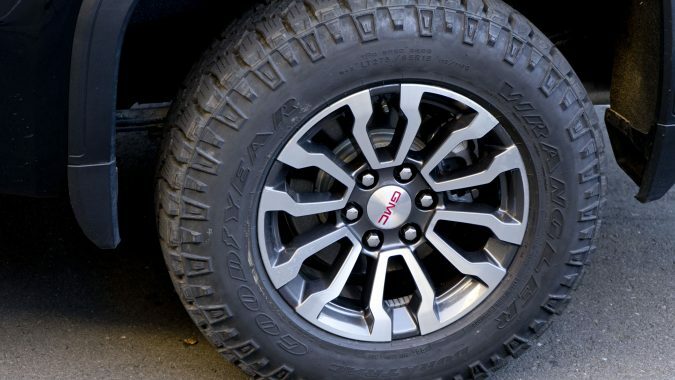 You also get 33-inch mud rated tires and Hill Descent control. 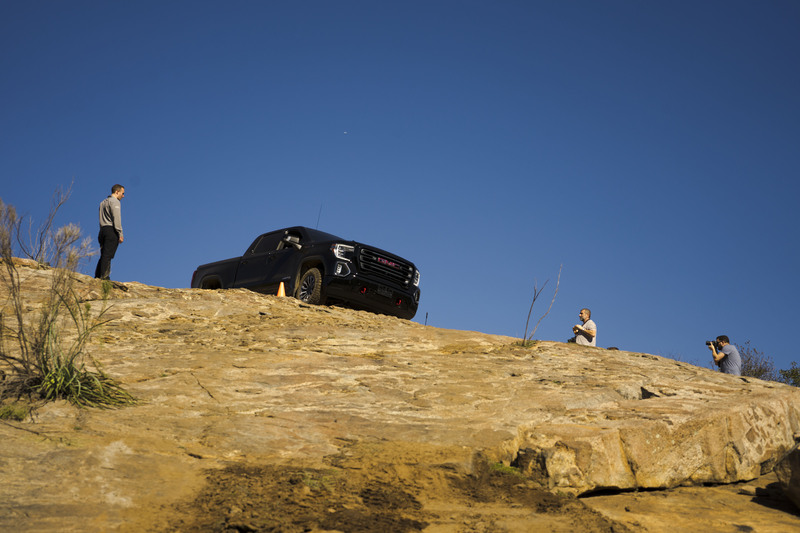 We headed out under deep blue skies with not a cloud in sight and temperatures hovering around the high 60s (about 20 C). 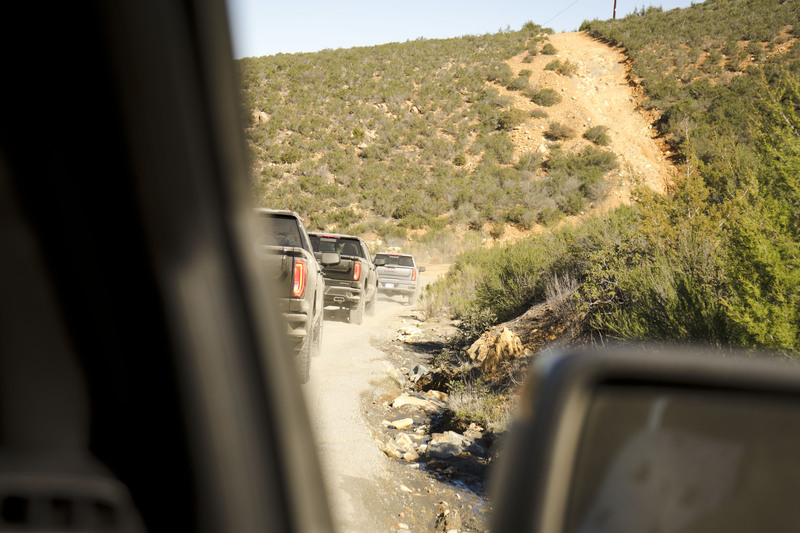 Just about the best conditions we could have asked for. 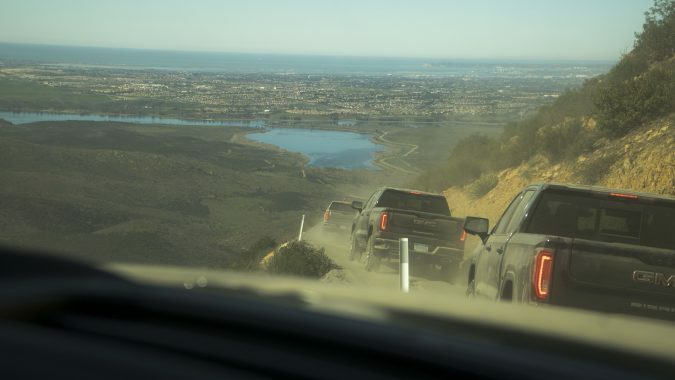 Our destination was the Otay Mountain Truck Trail just a few miles from the Mexican border. 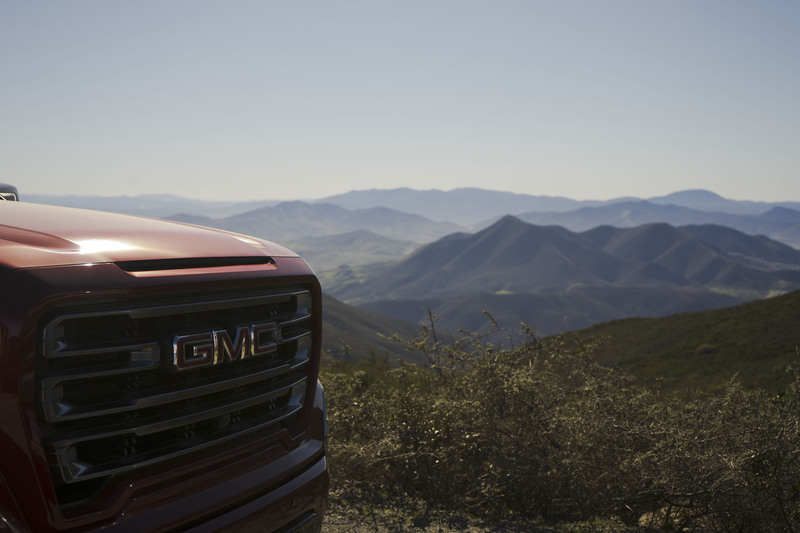 The Sierra looked perfectly at home against the arid backdrop of the California desert; eager to hit the trail. 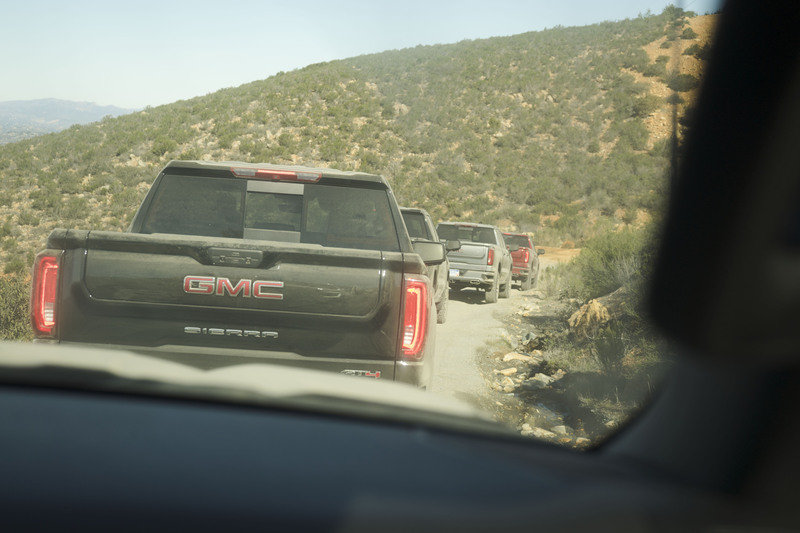 We headed out in the world’s largest convoy of AT4s up the narrow rocky path clinging tightly to the side of the mountain as we wound our way up; the surrounding scenery growing more and more beautiful with each bit of elevation we gained. 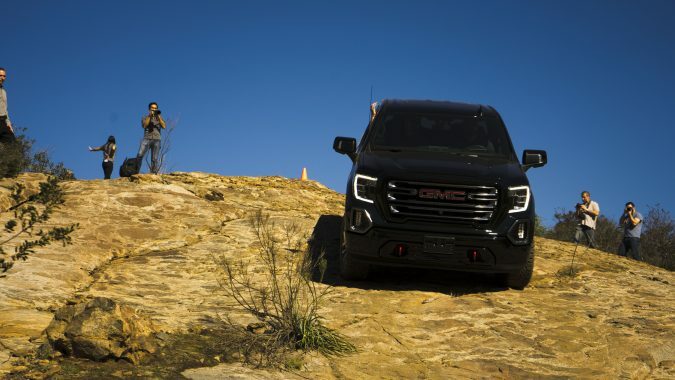 Barely wide enough for the Sierra, the lack of a guardrail made for a few sphincter tightening moments that reminded me not to look down, no matter how tempting, and just focus on the truck ahead. 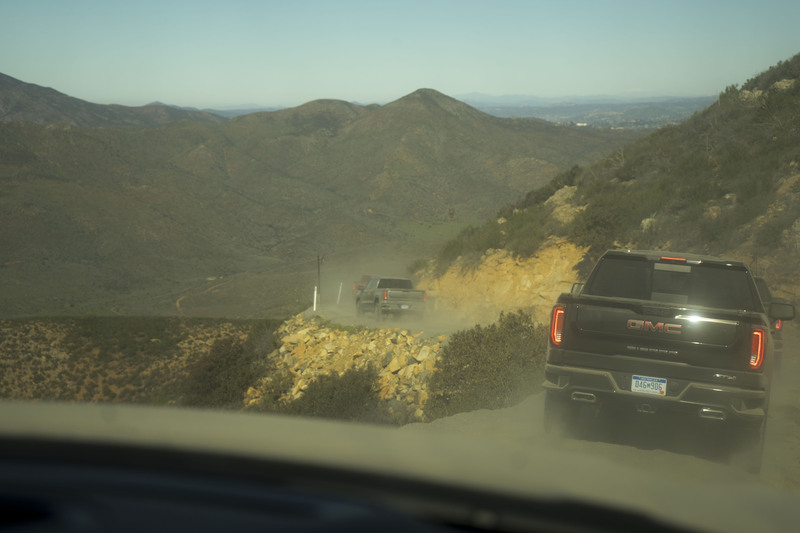 As we approached the top, views went from stunning to breathtaking. 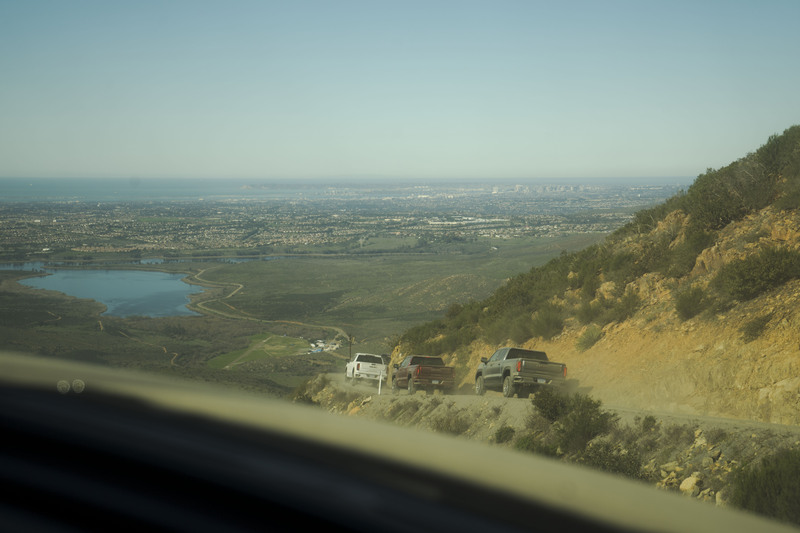 To our right, San Diego’s skyline appeared like a miniature city set against the vast Pacific Ocean. 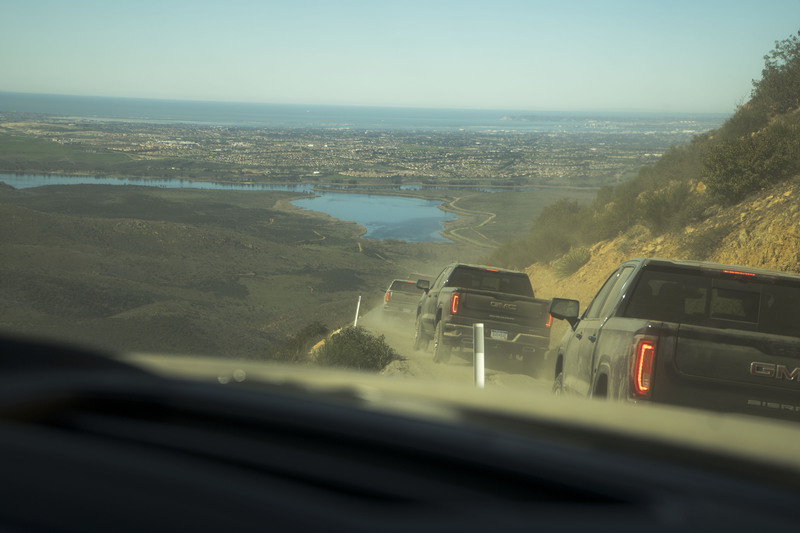 To our left lay the mountains of rural Tijuana as far as the eyes could see. 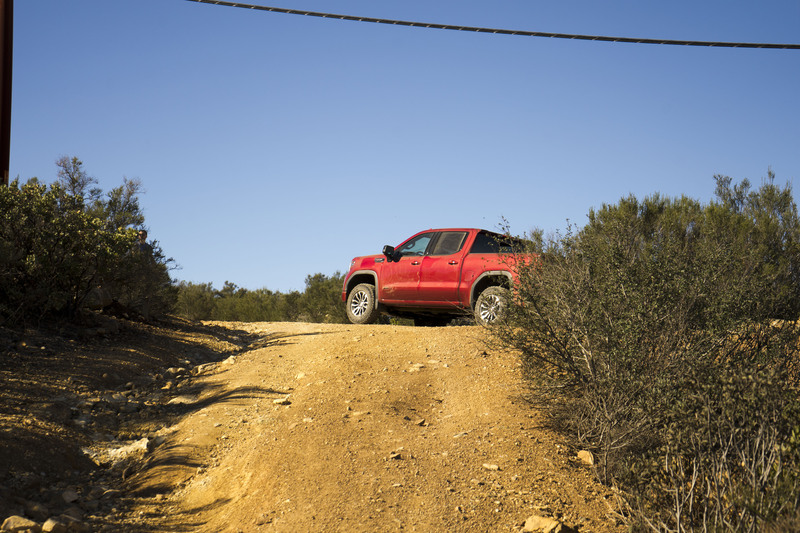 The trail itself didn’t pose much of challenge for the AT4, which sounded badass the entire time thanks to that new performance exhaust. 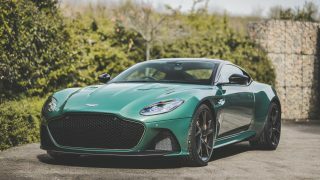 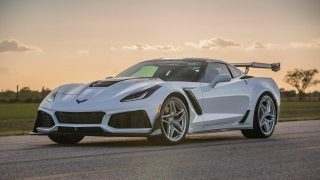 It added just the right amount of burbly V8 noise that you want, without sounding obnoxious. 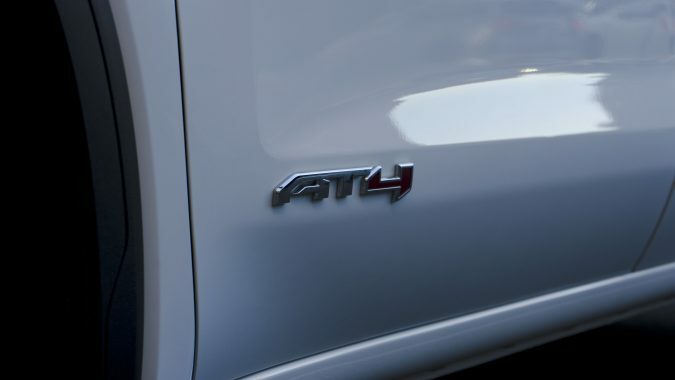 As cool as the AT4 package is, I couldn’t help but feel that it needed more of a challenge to showcase its abilities. 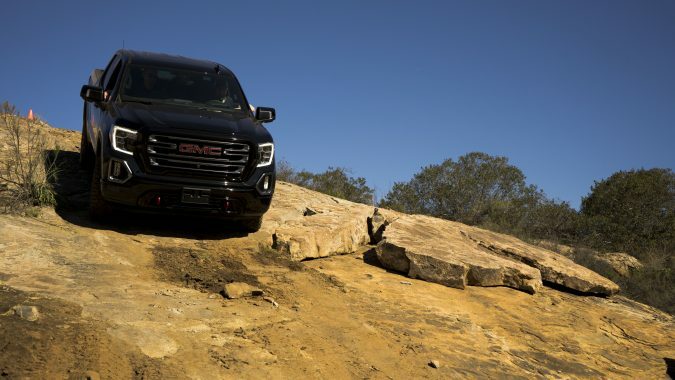 So it was a good thing then that our next stop included a bit of a rock climb up what was basically a giant boulder sticking out of the ground. 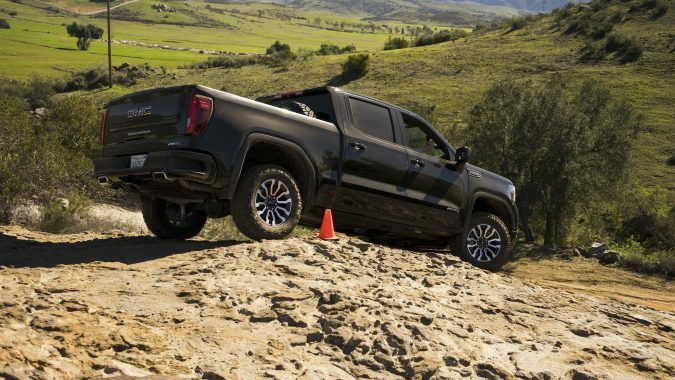 Using low range gearing the Sierra made it up and down the 21-degree slope quite easily, albeit with an instructor guiding us from the passenger seat. 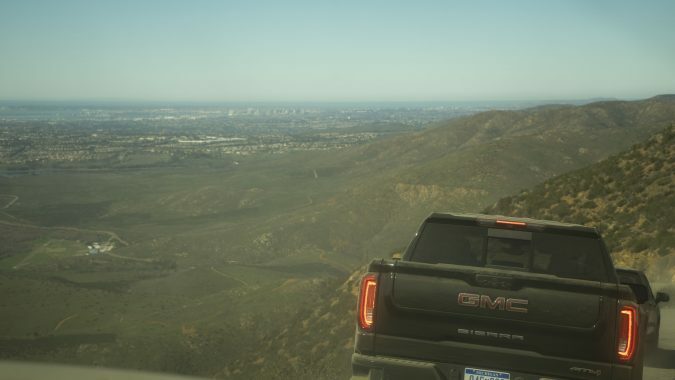 The surround view cameras really come in handy here, especially during those steep ascents, when all you can see out the windshield is sky. 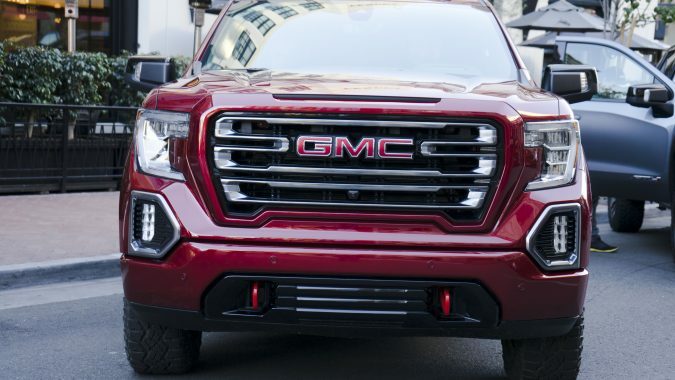 Switching to the front bumper view takes the guesswork out of it and can easily help you spot any obstacles or rocker panel damaging rocks that would have been missed otherwise. 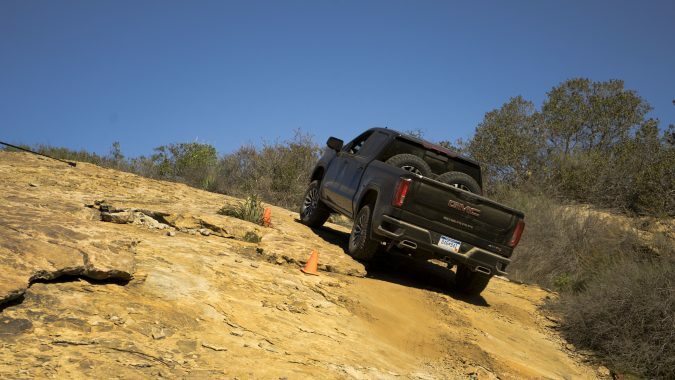 Once again the Sierra made short work of the course, barely breaking a sweat. 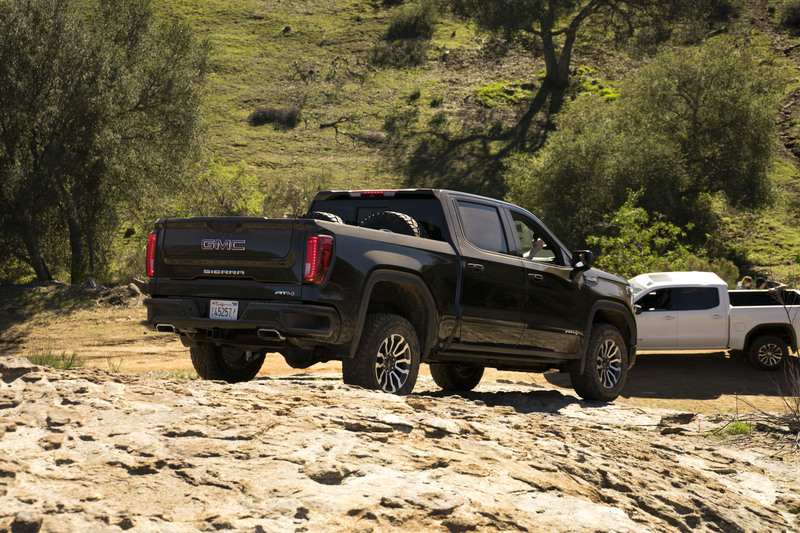 I’ve negotiated rougher surroundings with less capable vehicles and I knew the Sierra could do way more. 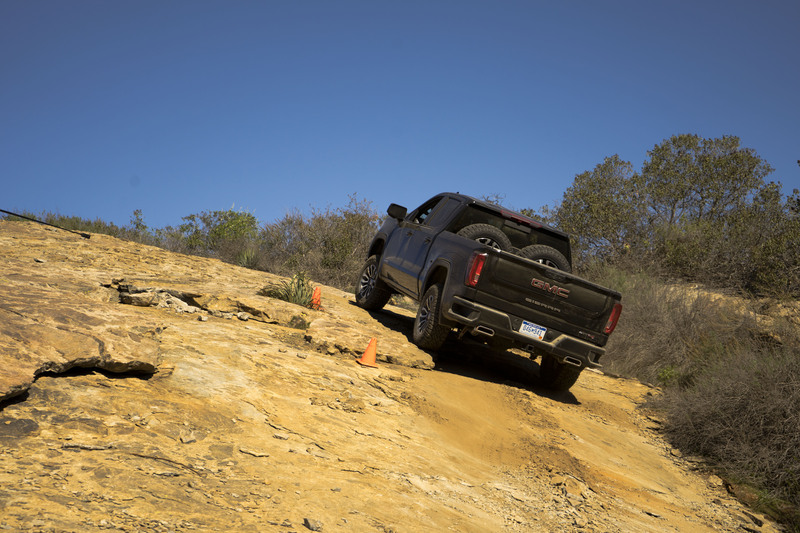 The descent didn’t require the use of the hill descent control and it would have been nice to put that to the test. 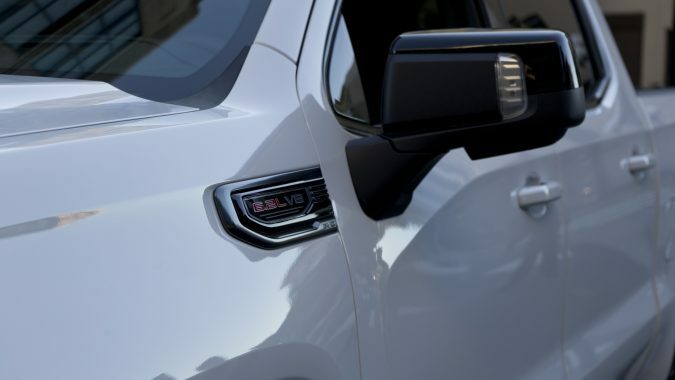 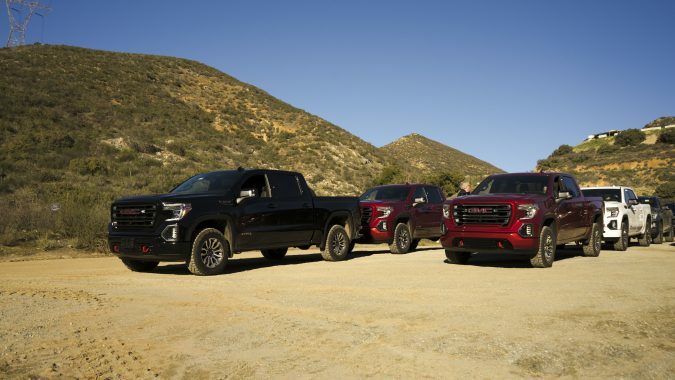 Going on sale late last year, the Sierra was completely redesigned for 2019 and has quickly gained more popularity than its nearly identical cousin—the Silverado. 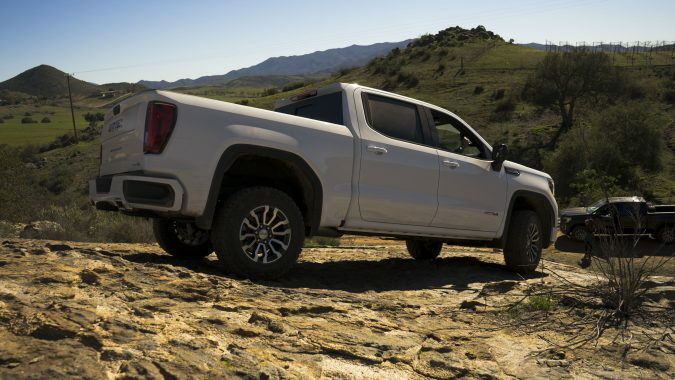 Like the Silverado the new more upscale Sierra is bigger in nearly every dimension but manages to shave a significant 163 kg of weight over the outgoing generation thanks to the use of aluminum for the hood, doors, and tailgate. 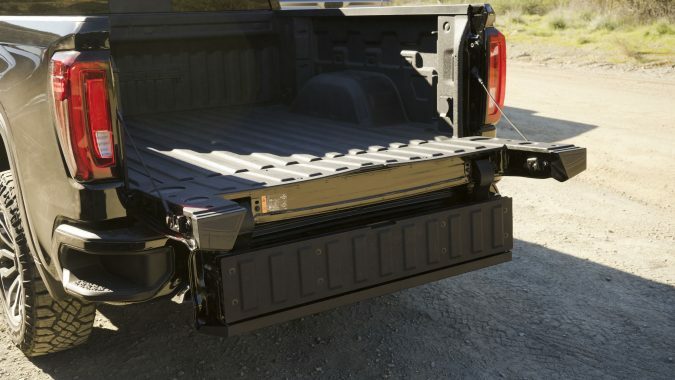 They’ve also incorporated more high-strength steel in the chassis and the roll-formed steel bed offers the most cargo capacity in its class. 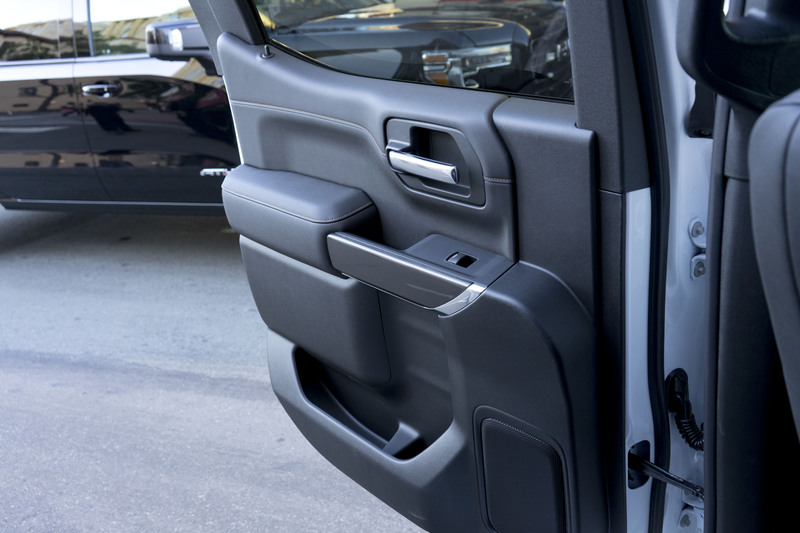 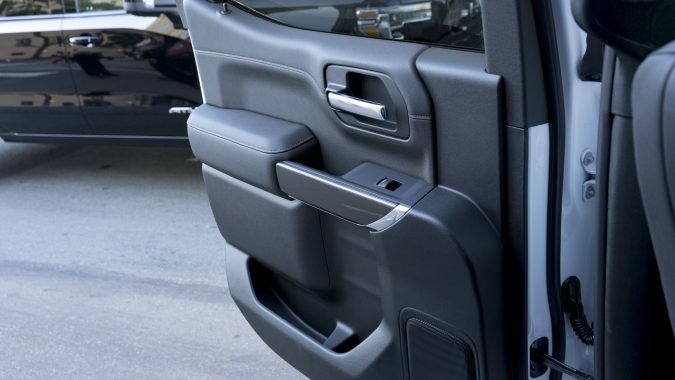 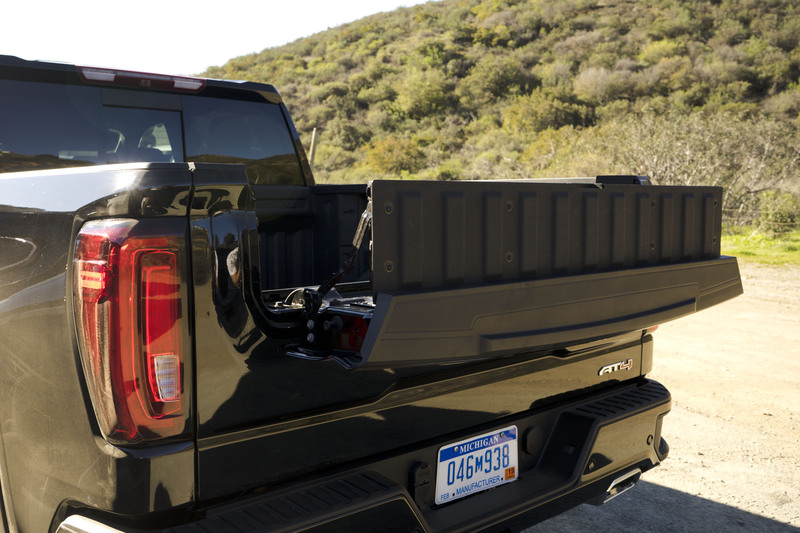 Rear seat passengers in the crew cab now benefit from an extra 3-inches of legroom. 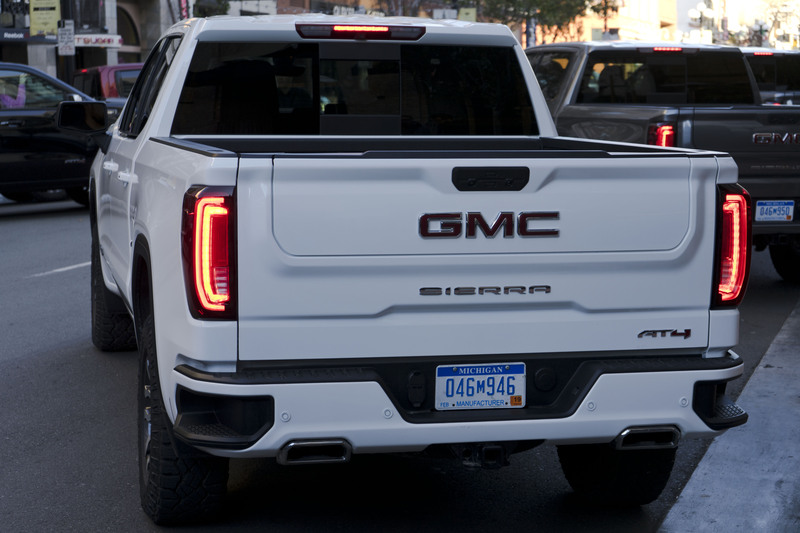 The Sierra will also be the first pick up truck in the world to get a Carbon-fibre box that made some pretty big news last year and is due to come out soon. 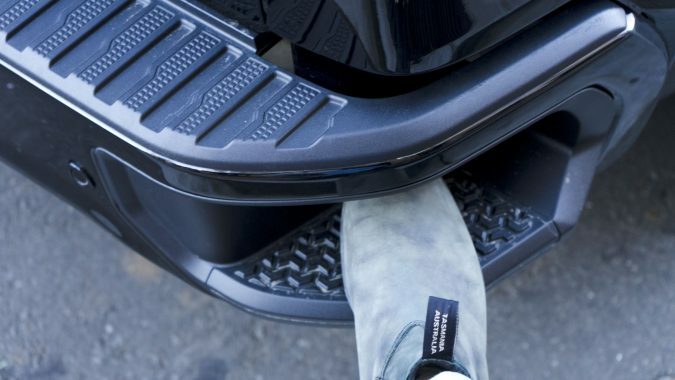 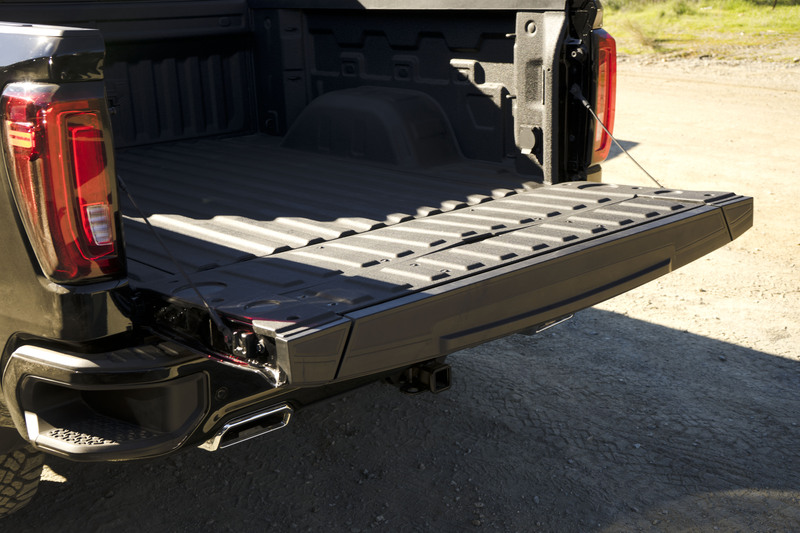 But my favourite feature and the biggest difference over the Silverado, other than its appearance, is the MultiPro tailgate, which has to be the most innovative tailgate in the industry. 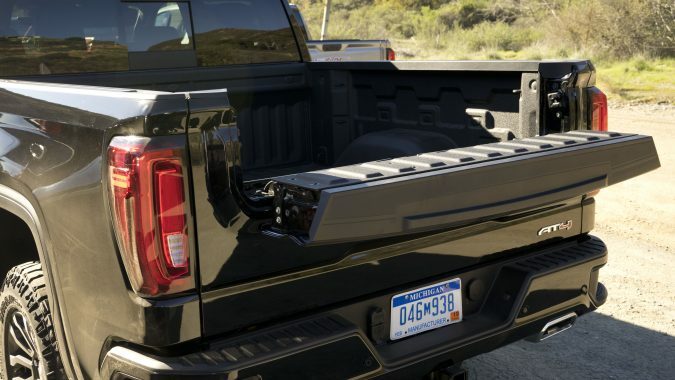 Essentially two tailgates in one, MultiPro offers 6 different configurations that allow for easier access to the bed contents; provides a makeshift workspace, or a step that can support up to 170 kg. 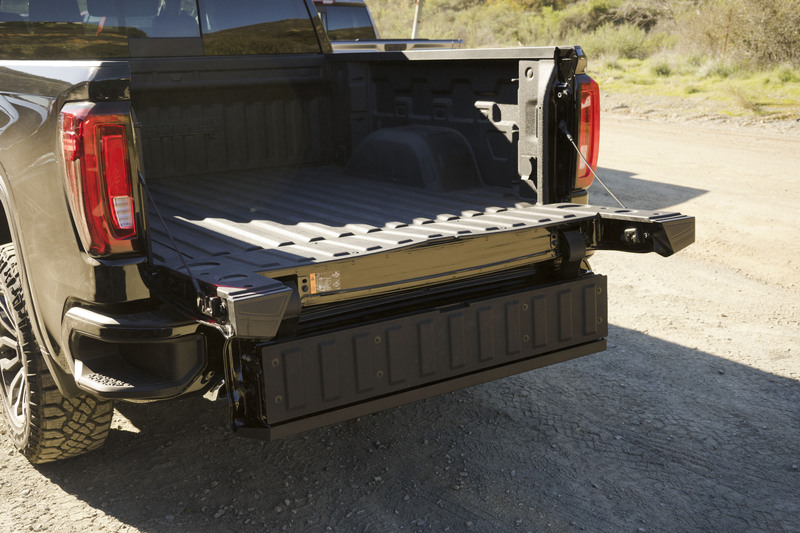 It can also form a load stop to safely transport longer items or be used to create two tiers of storage. 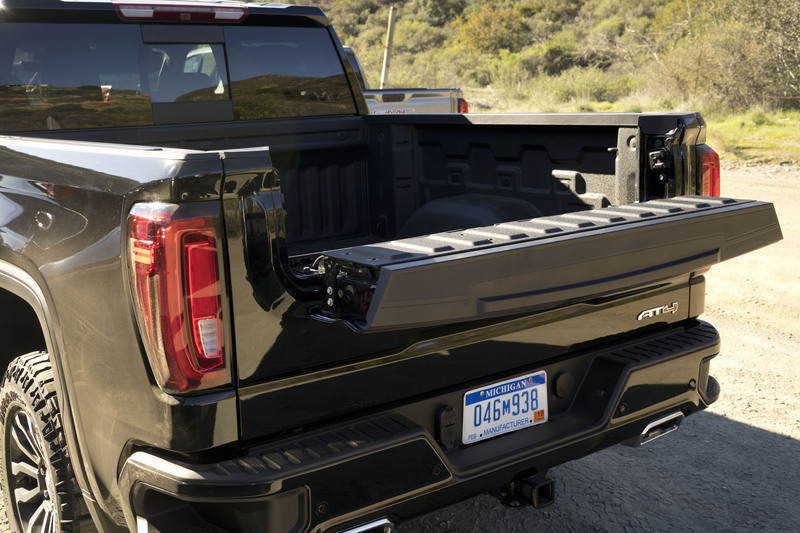 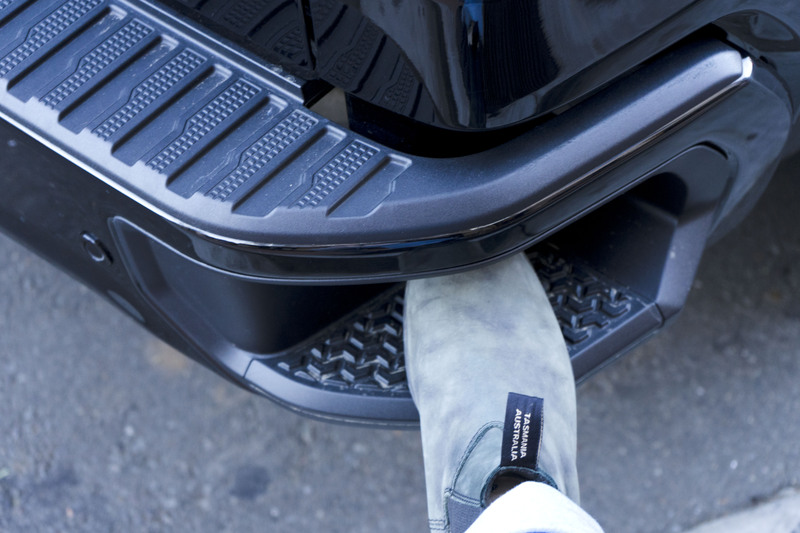 The MultiPro tailgate comes standard on the AT4 and Denali trims. 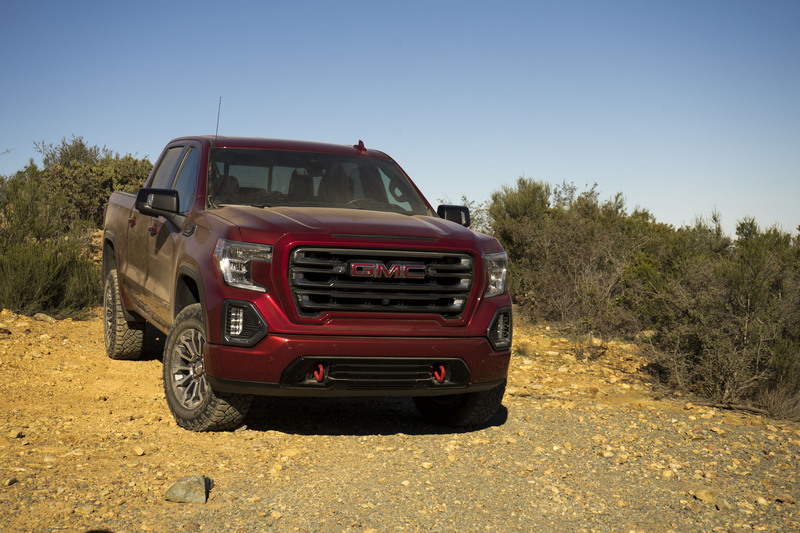 Out on the highway, even with the knobbly 33-inch Wrangler Duratrac tires, the Sierra’s ride was smooth and only the slightest bit of tire rumble could be heard in the quiet cabin. 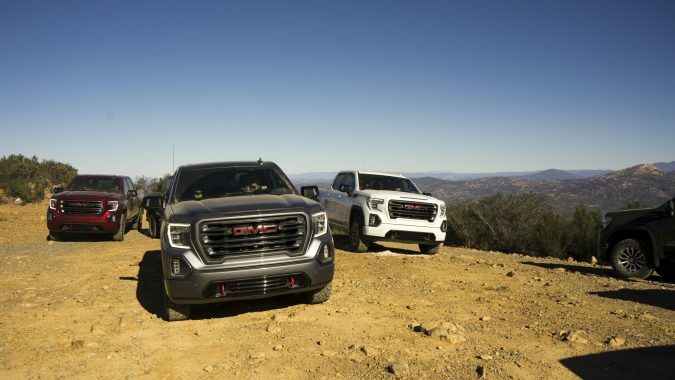 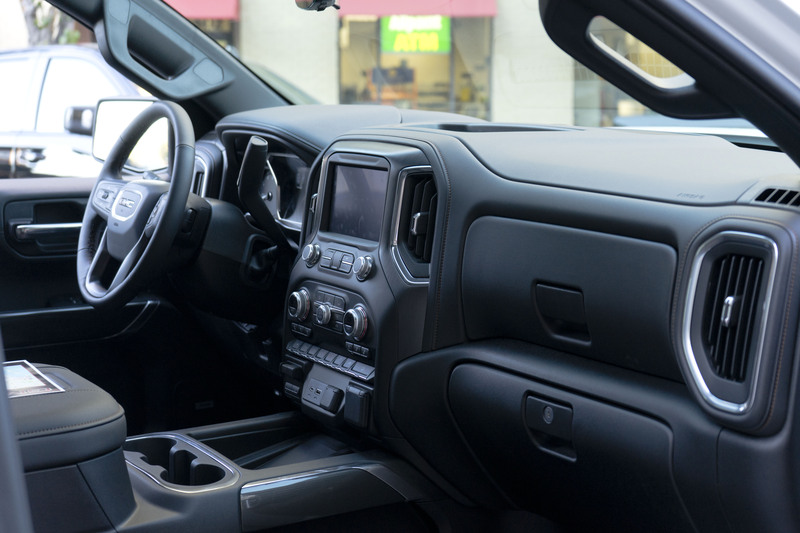 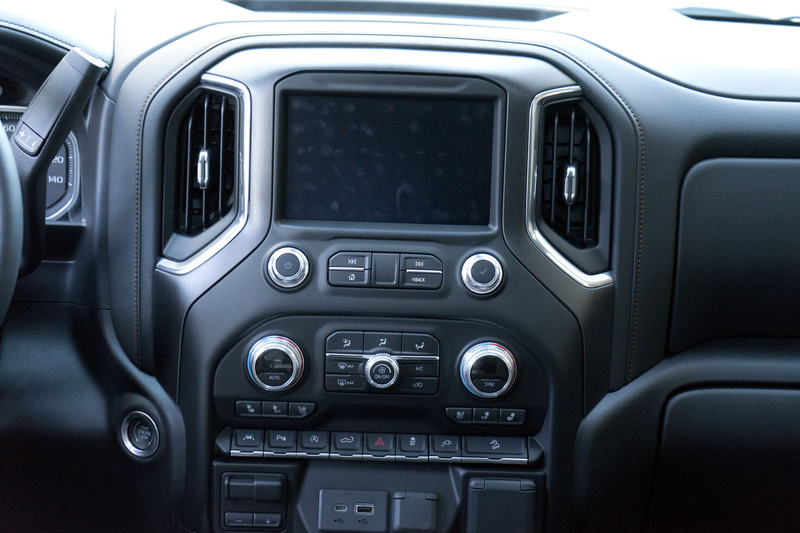 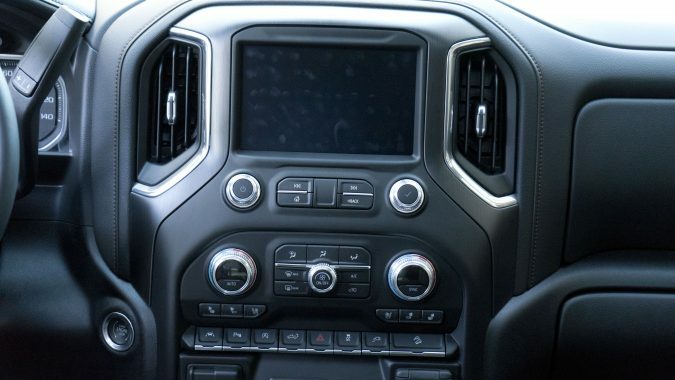 This new generation of pick up trucks have come a long way from their purely utilitarian roots and just keep getting better and better, offering more refinement and creature comforts than you would ever think possible. 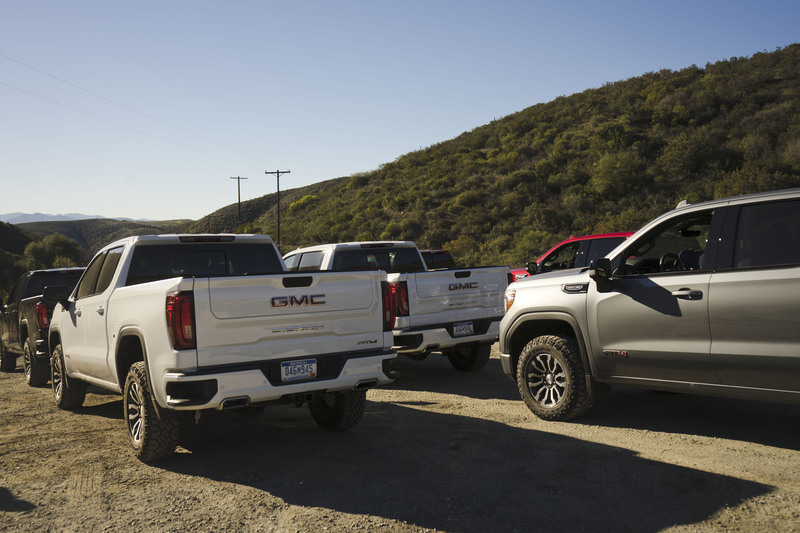 Pick-ups wear many different hats these days, many have taken the place of the traditional family car. 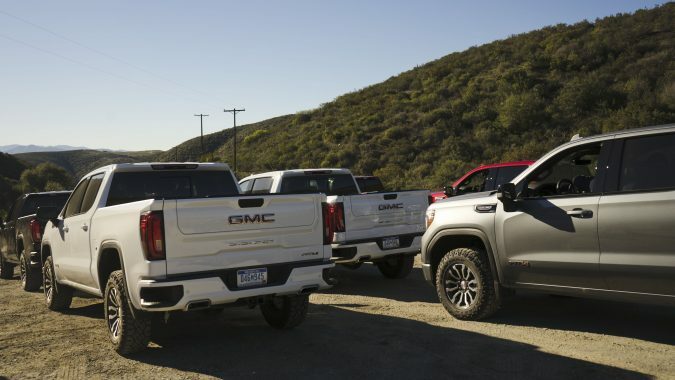 You’re more likely to see them at the grocery store parking lot or at a school run than at a construction site where you would think they belong. 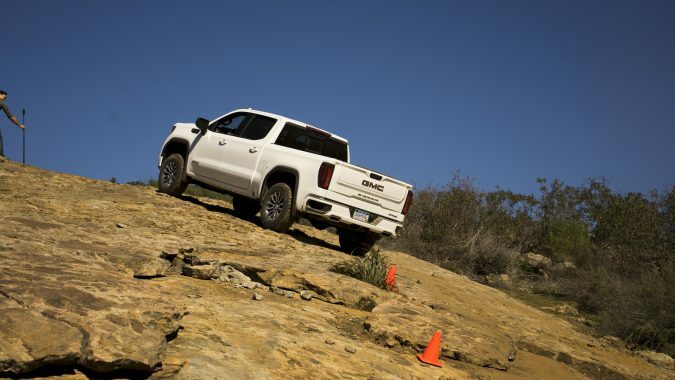 If you’ve never been inside one recently, especially those equipped with crew cabs, you’d be in for a bit of a shock. 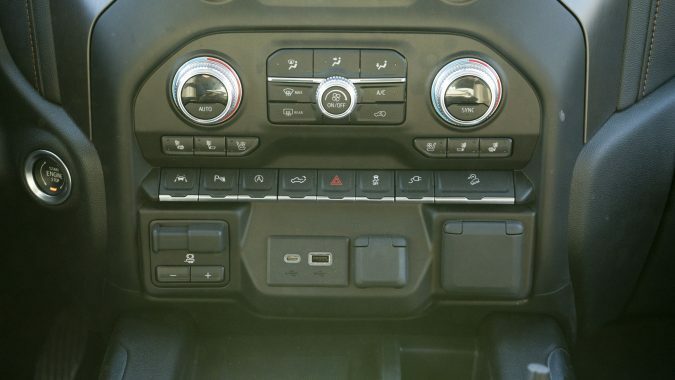 Almost every creature comfort that you’d find in a German luxury car is accounted for here. 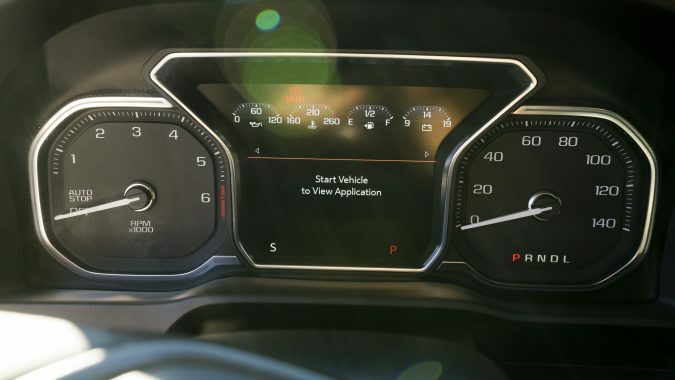 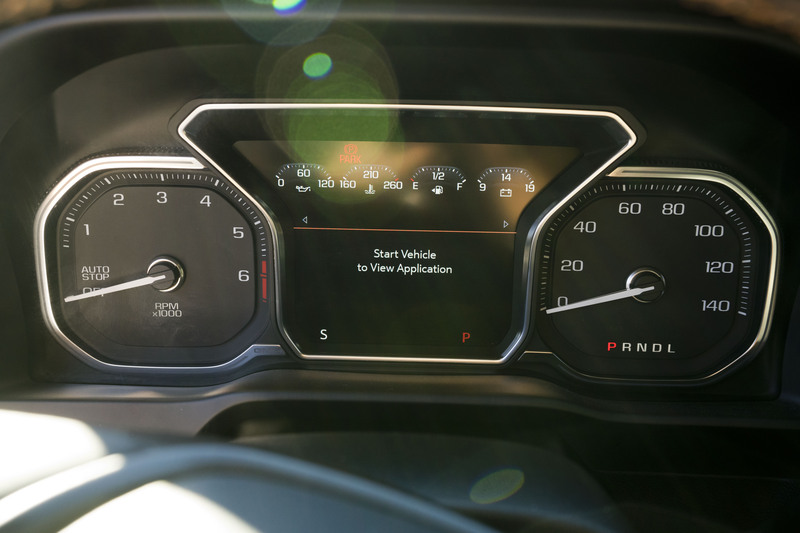 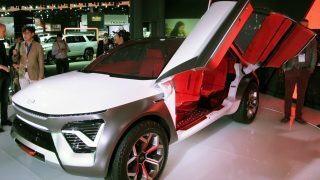 Stuff like fully featured infotainment systems, and a large colourful head-up display, stitched leather seats that are heated and ventilated, lane guidance and forward collision alert systems and surround view cameras. 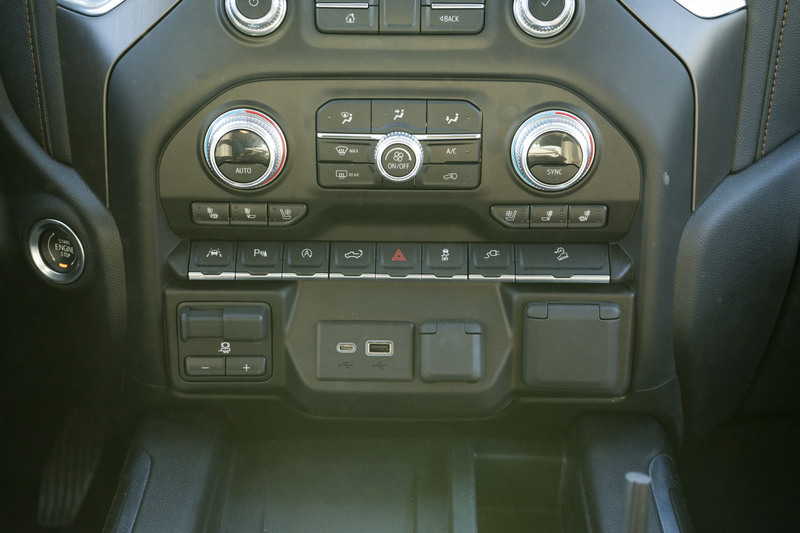 There is an abundance of USB outlets and power outlets, and there’s under-seat storage and more storage behind the seatbacks. 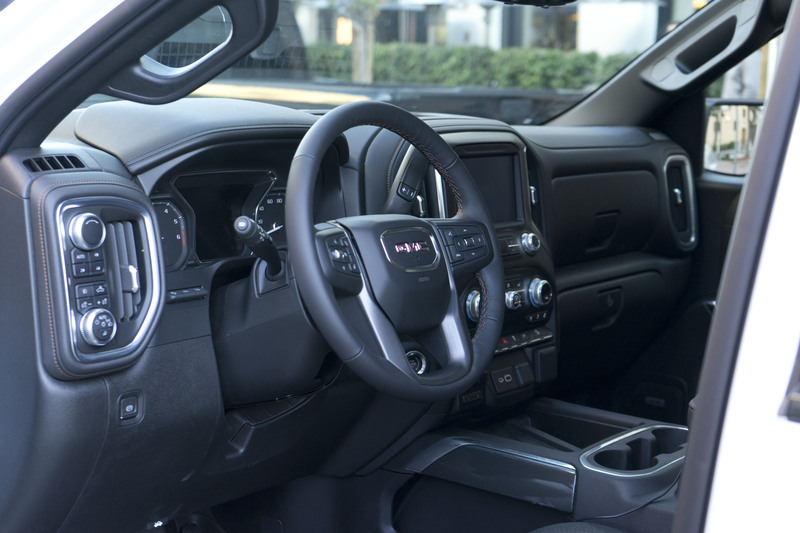 It’s like a small house that you can drive. 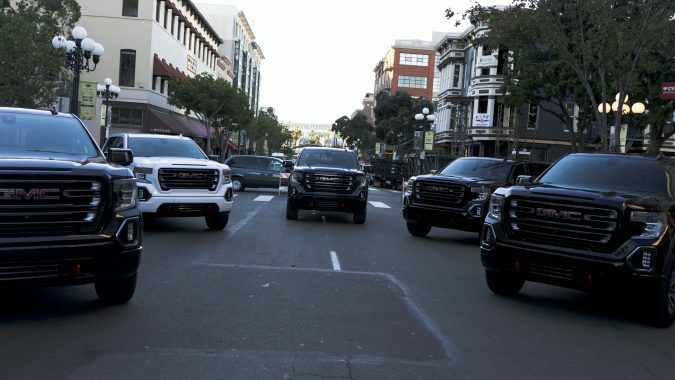 They’re quiet and refined, and I mean actually refined; even 10 years ago NVH levels this low were unheard of in trucks of this size. 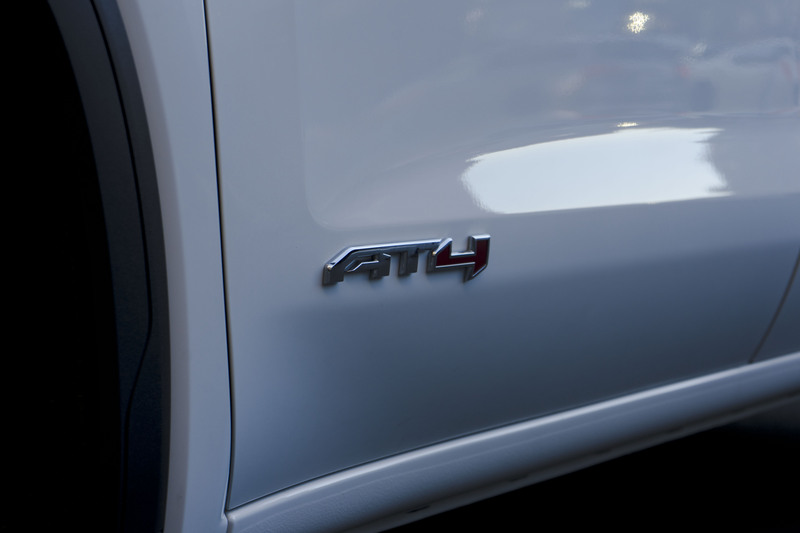 The 6.2 litre V8 has no turbos and doesn’t need them and it just sounds good everywhere it goes. If you like your trucks with a bit of shout this exhaust system is well worth it. 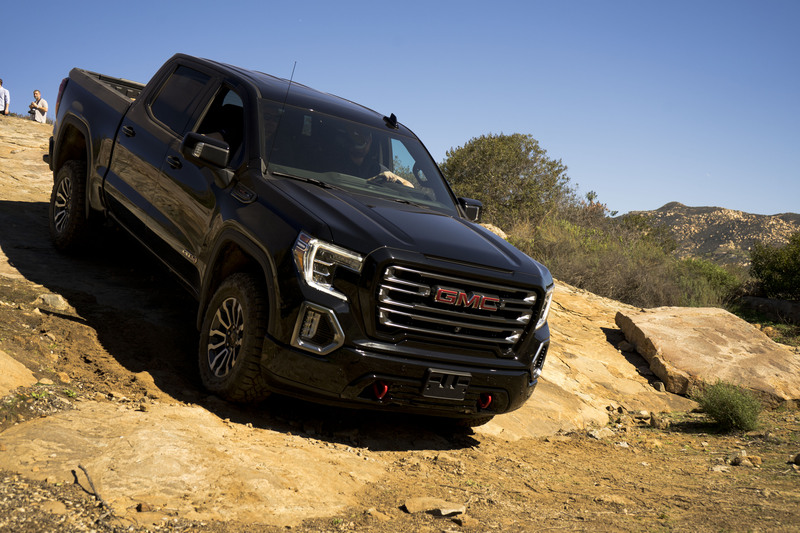 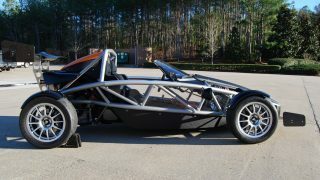 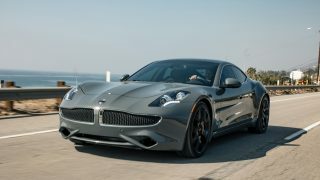 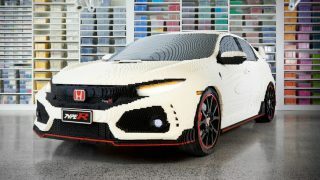 Paired with the 10-speed automatic, acceleration is plentiful, the shifts are smooth, and there’s ample pulling power. 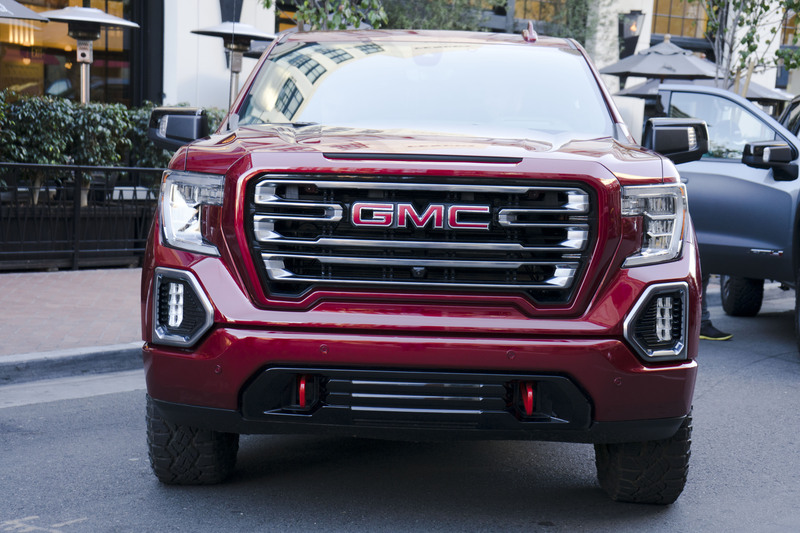 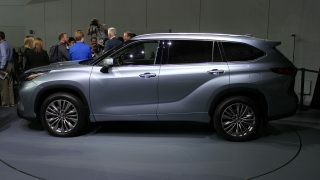 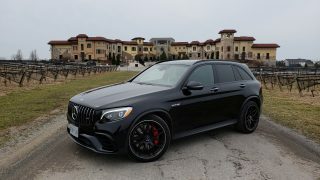 An auto stop/start system is appreciated, and the 15.3L/100 km rating in the city and 11.8 on the highway is about the average for a truck of this size. 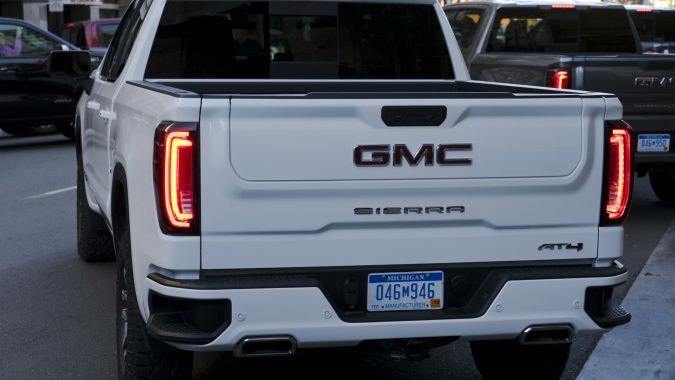 During our brief stints with the AT4, getting a true read on the economy was not going to happen but you don’t buy a Sierra to save fuel. 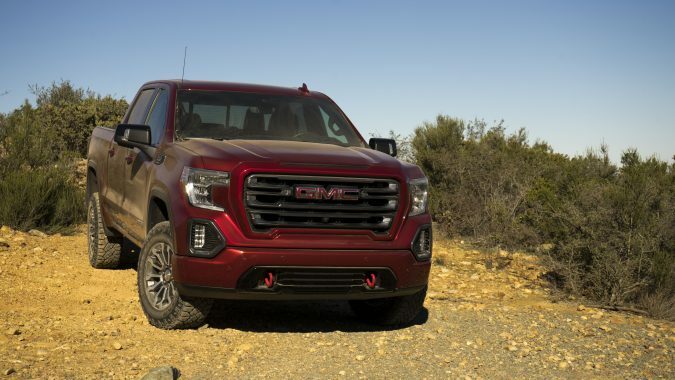 AT4s can be distinguished by their bright red tow hooks and the black chrome grille and fog light surrounds and big mud rated tires. 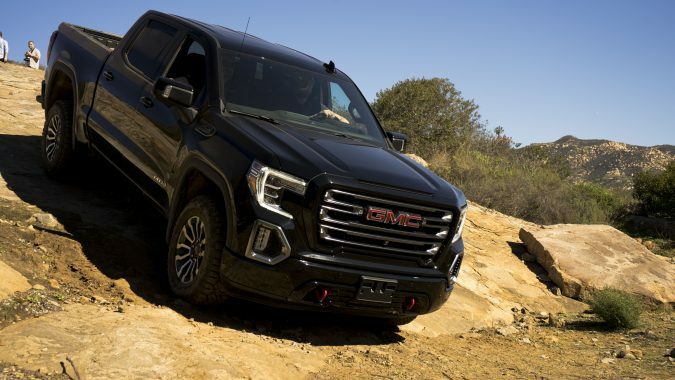 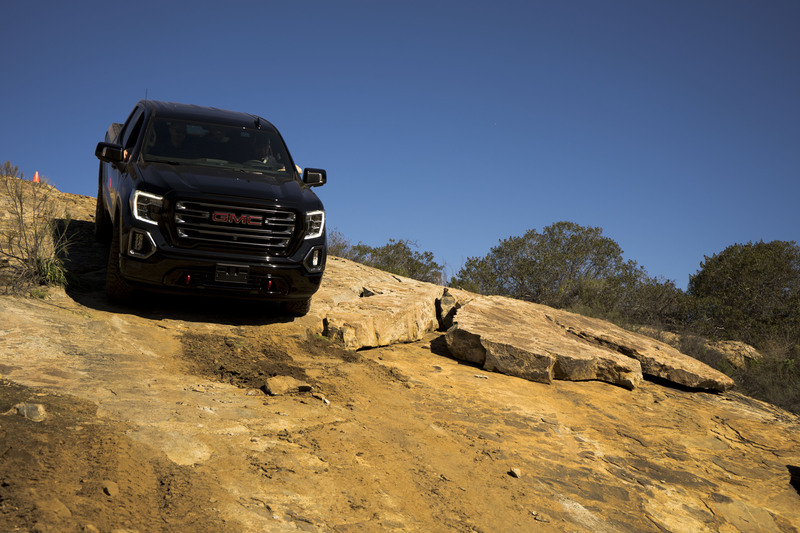 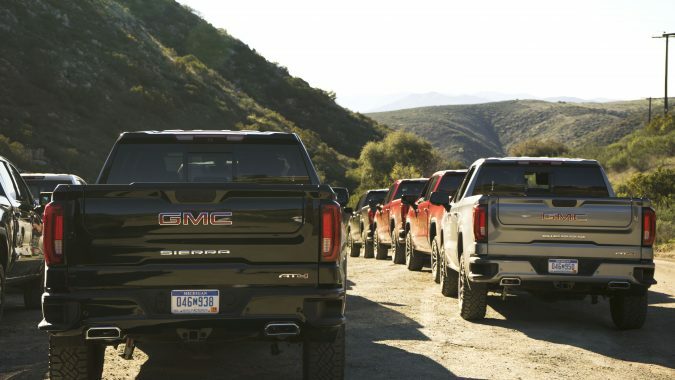 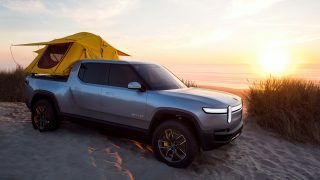 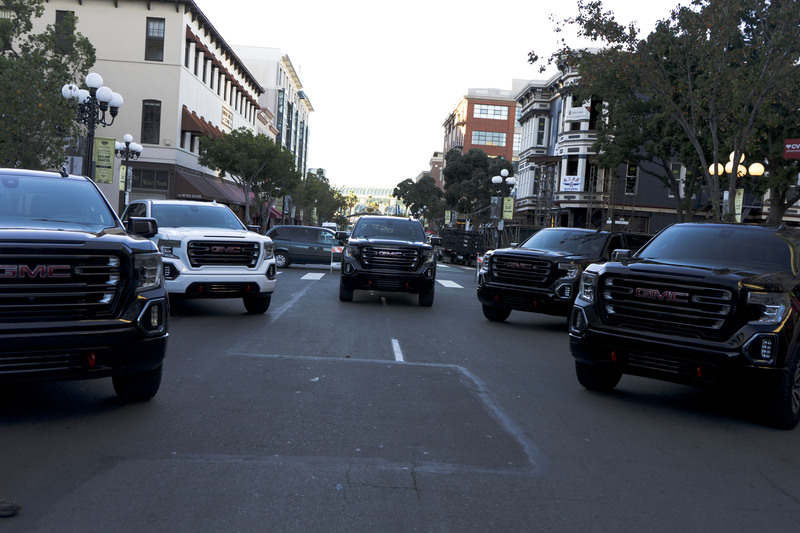 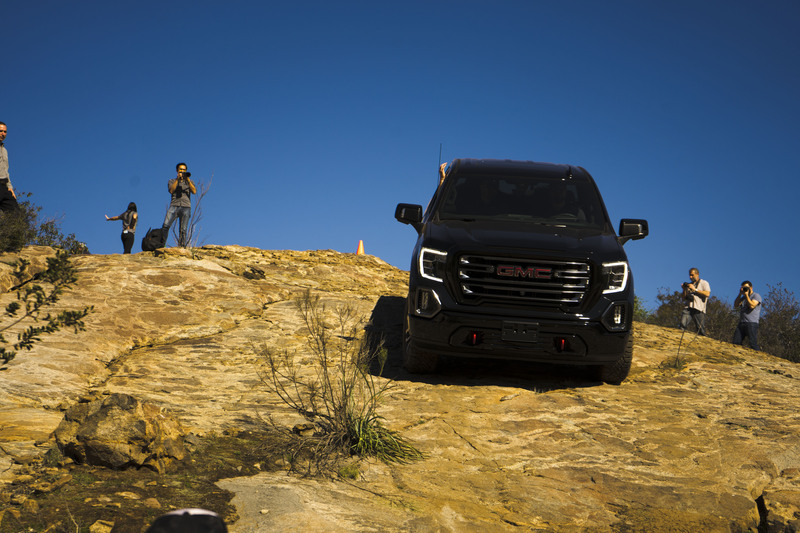 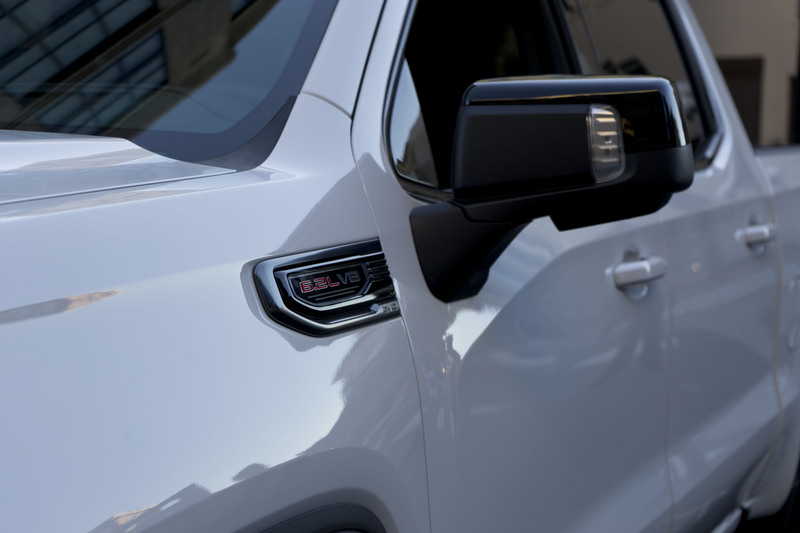 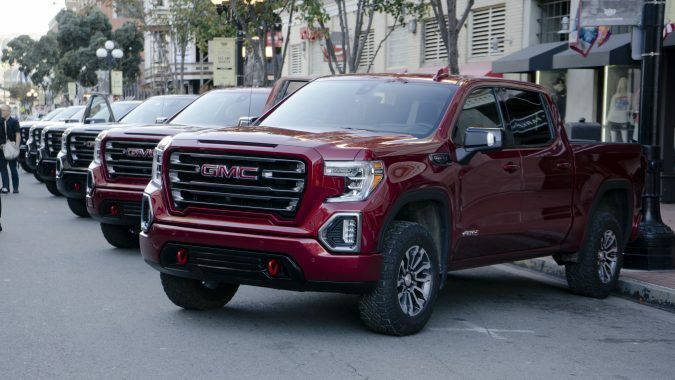 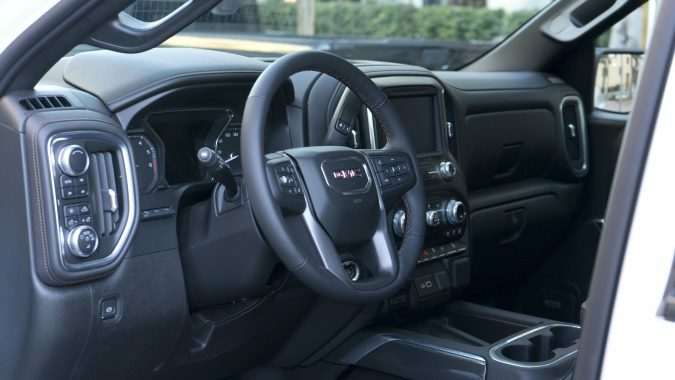 GMC will start to offer everything in their lineup with this new AT4 off-road inspired package in addition to their already popular Denali line. 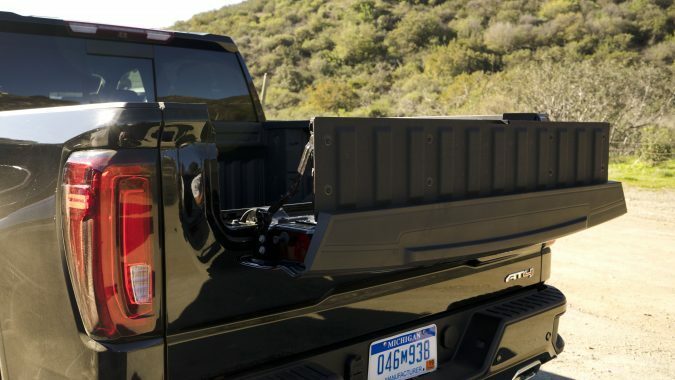 The newly revealed Sierra HD will also get an AT4 trim package although that one isn’t due just yet. 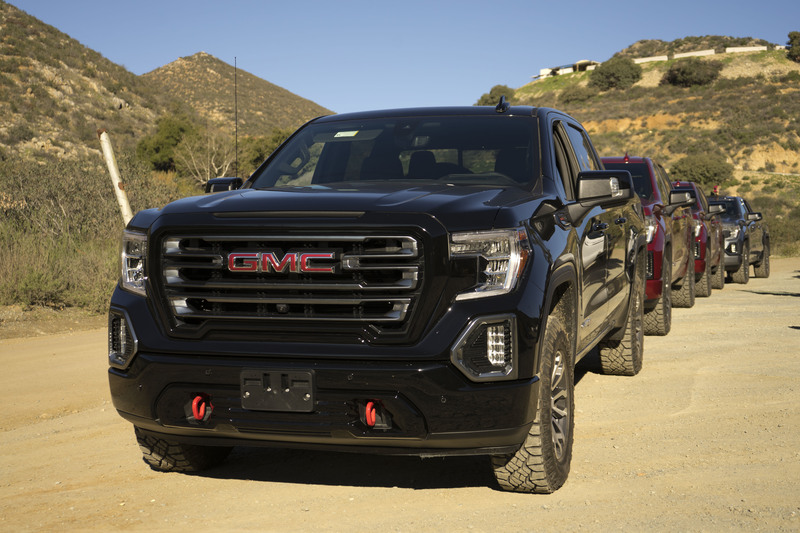 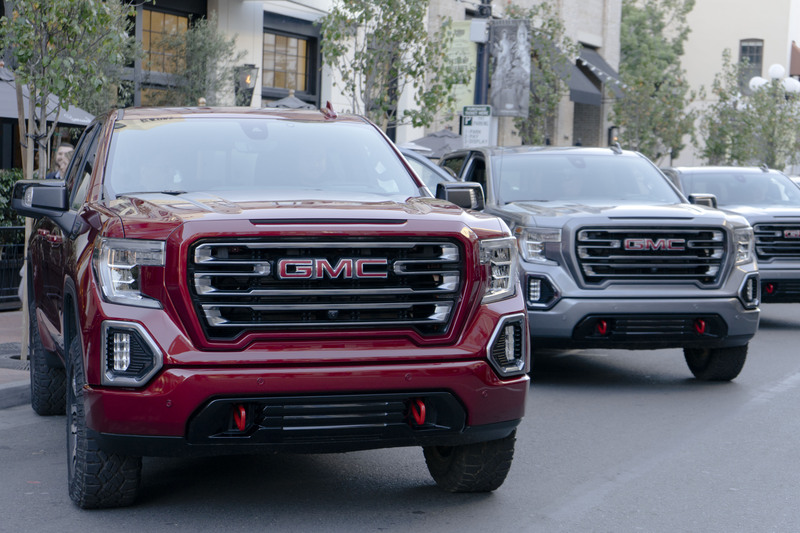 2019 Sierra AT4s start at $61,500 for the short box and another $300 more for the standard box and are on sale now.